which are all connected and tend to create more complex structures as they are combined. I felt quite organised in preparing for the exercises which lead up to my final choice because I thought I was clear in what had to be achieved. I made visits to a range of places, taking with me small index cards with lists of aspects I needed to cover. There was London of course. I visited Seaford on the East Sussex coast for the first time and experienced the challenges of dealing with different light conditions. I also visited Stopham in West Sussex and went twice to Watts Memorial Chapel and Cemetery in Surrey, designed by Mary Watts, wife of the painter because I was fascinated by its curves and bas relief shapes. I was pleased that I overcame some of my inhibitions and photographed people celebrating the royal wedding and enjoying local carnivals. What happened was that in each place I got drawn into exploring particular aspects and forgot some of the others. I ended up with many raw images and a computer desktop covered in folders which is unlike me, but I didn’t want to ‘forget’ anything. Within all this whirl of photographic activity I kept putting off writing up the exercises and began to feel swamped. It was difficult to decide on one subject because although I had covered everything needed overall I couldn’t, at first, find one subject that contained everything needed. I woke up one morning with an inspiration to take on the challenge of finding these graphic elements in photographs of people. I did but had to use some quite old photographs to achieve this and I wanted to use new photographs. Eventually I slowed down and gave myself a calmer thinking space. 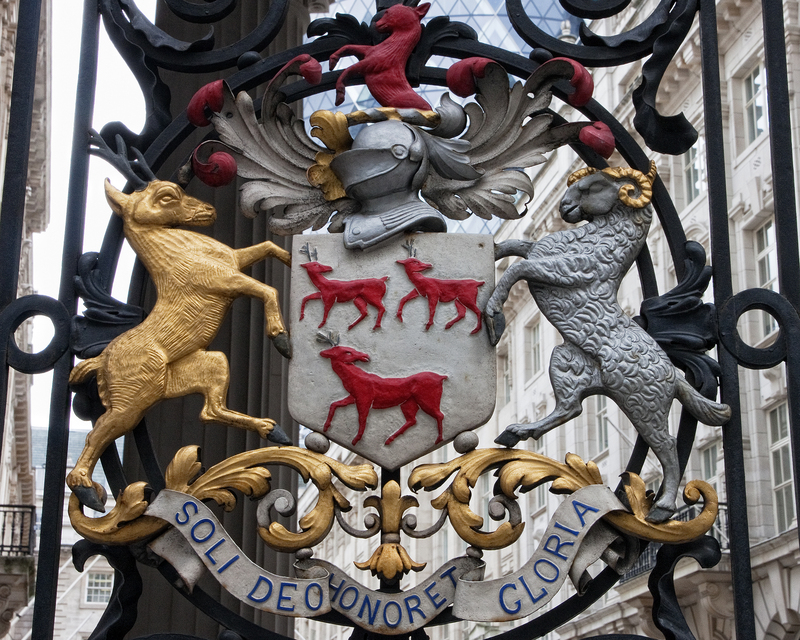 The exercise images utilise examples from the variety of visits etc and I have chosen London as my Assignment subject – mostly the City of London. A point has to be a very small part of the overall image but it must contrast in some way with its setting to be significant. I think the illuminated red heart does this quite well. I’ve been thinking that I could have focussed in much more closely but then the red boxes beneath the heart might have become more prominent and lessen the impact of the heart as a point. I have had some debate with myself about this in terms of which point is which and, indeed, whether there are just two points. It depends which point of view you take as it were! The sign stands out against the whitened brick wall and the black door but, then again, the red cross also stands out for me against the sign. I don’t think that the sign against the wall would have been interesting enough in itself. To me it needs the balance of the door, especially as the blackness of the door is highlighted by the two studs on the door jamb. The arrangement of the elements in this elaborate gate detail form themselves into circular and triangular shapes. The baseline is the pavement and the hospital roof lies around one-third upwards. I wonder, looking at it now, whether the architects of the new blocks behind designed it to gain this effect. There is rhythm in the portico columns and all the windows create patterns. This was taken at 35mm focal length at f13 and the smaller aperture has compressed the perspective. The horizontal lines are defined by the name panel above the columns; the roof of the older building and then by the window ledges. The vertical lines of the columns add strength and, I think, a sense of stability to the older building, whereas the vertical lines of the glass windows on the upper left of the newer block make it look more fragile to me. I didn’t feel entirely sure about including this even though I personally like the effect. 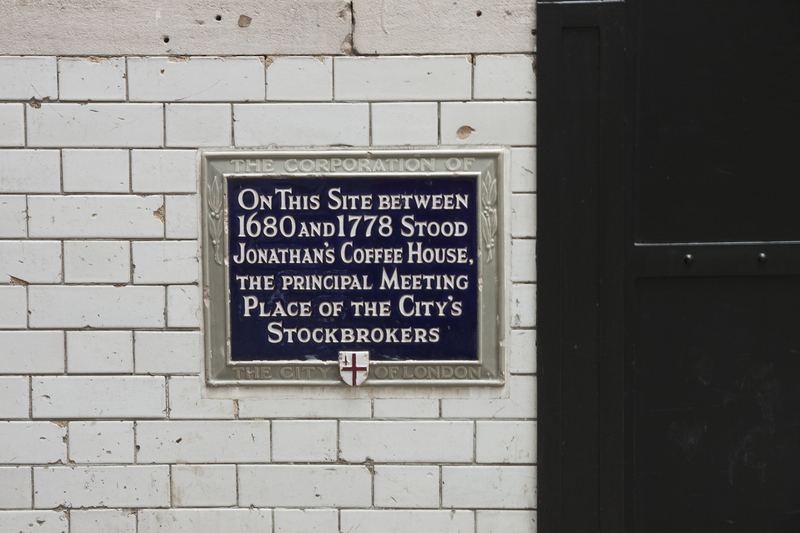 Looking at it again I can now see that the signs constitute two points which I hadn’t quite realised before. 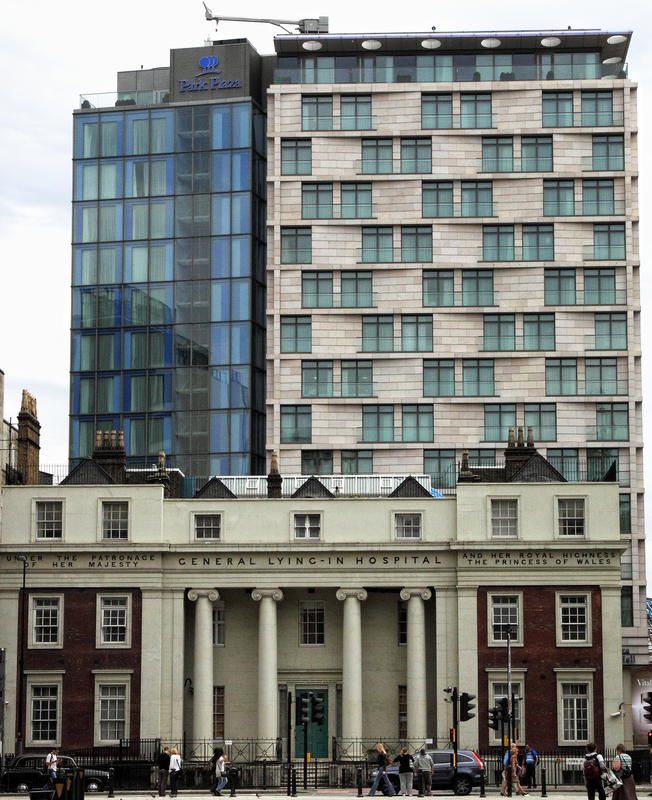 In this composition they break uup the rhythm/pattern of the building but it might have been a bland image without them. 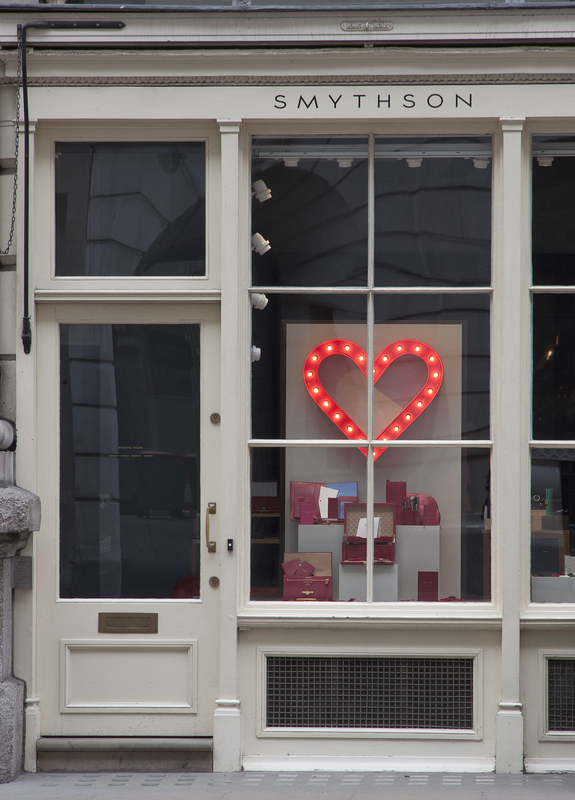 I took this from across the road (85mm lens at 35 metres away). Alternatively I could have moved much closer and angled my camera upwards to accentuate the verticals of the windows and impression of height. 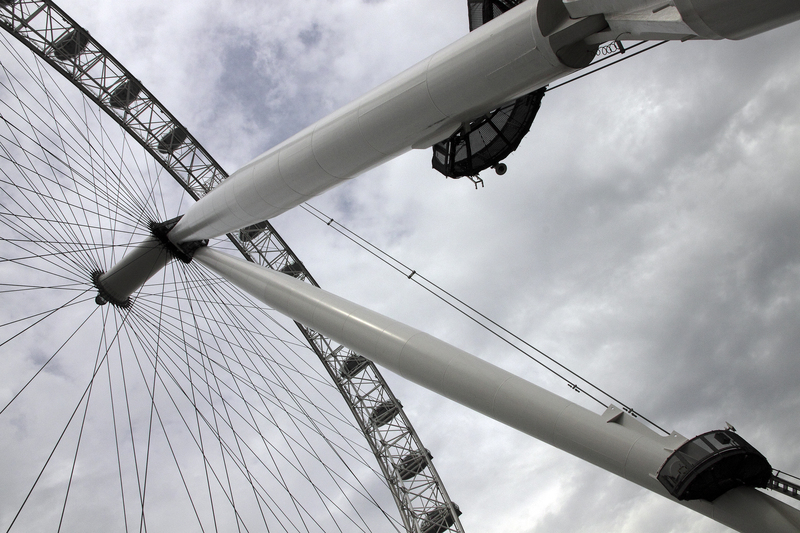 Here I tilted the camera, but only slightly, to accentuate the effect of the supports of the London Eye. The diagonal lines also combine to form an implied triangle. Curved feminine bodies in a curved shape. This is ‘Chimera with Personifications of Fire and the Sea’ by Francis William Doyle-Jones. 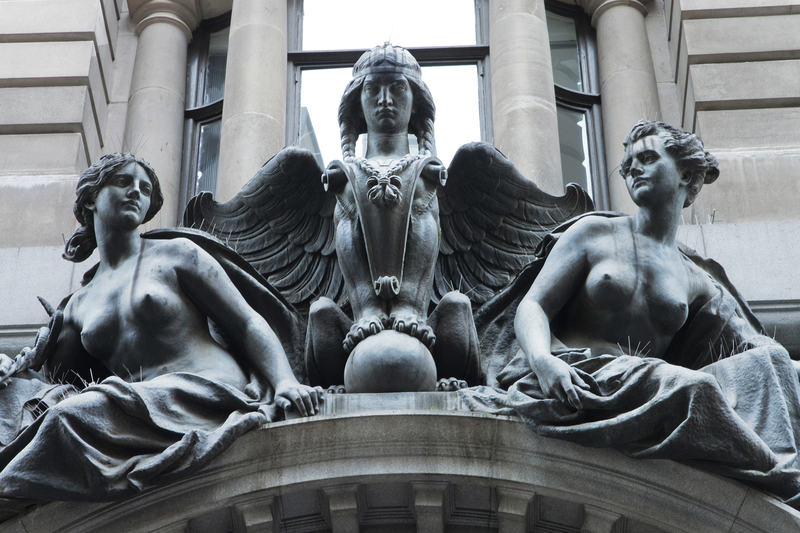 The sculpture is over the doorway of one of the buildings in the City of London (24-8 Lombard Street) which used to be the Royal Insurance building. The statues represent insurance risks of fire and sea and, in the middle, the uncertainty of the future. The feathers in the wings of the hydra in the middle also have a diagonal/triangular aspect. Freeman points out that curves must usually begin as real curves (as here) but they can be exaggerated by being viewed at a more acute angle. this occurred here because I angled my camera upwards from the pavement and the doorway is quite high. 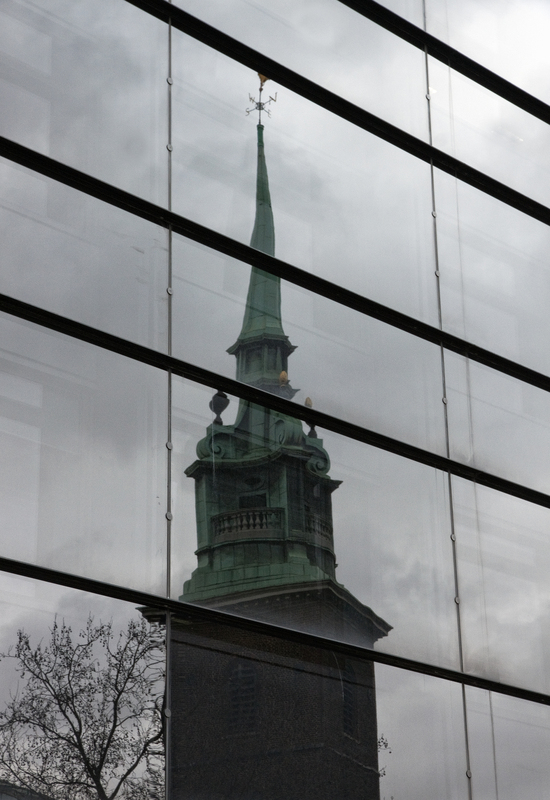 Reflection of Old Hallows Church steeple on Tower Hill which also forms an actual triangle. 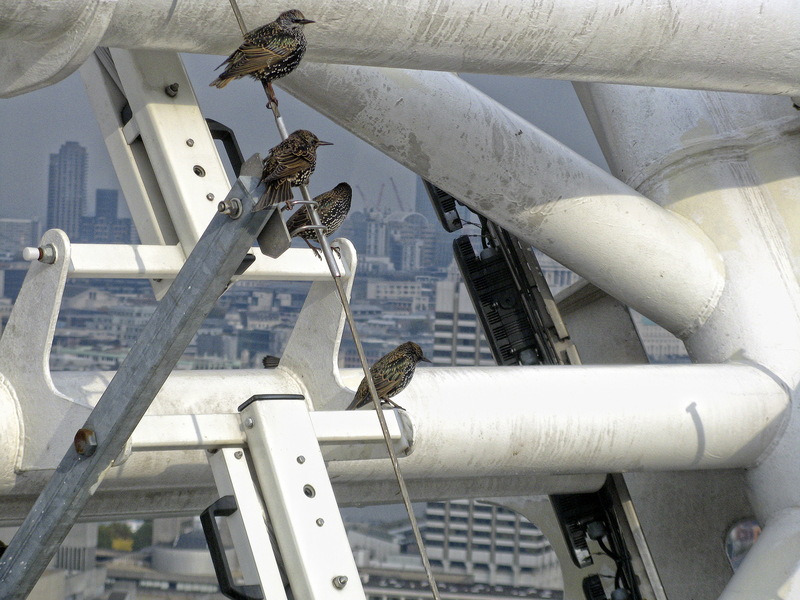 The birds on the support of the London Eye had nicely arranged themselves to form part of a triangle with the diagonal structures. I think that the birds increase the effect of the implied triangle, particularly the bird at the top which highlights its apex. There are other actual triangles here of course formed by the shape of the supporting structure. 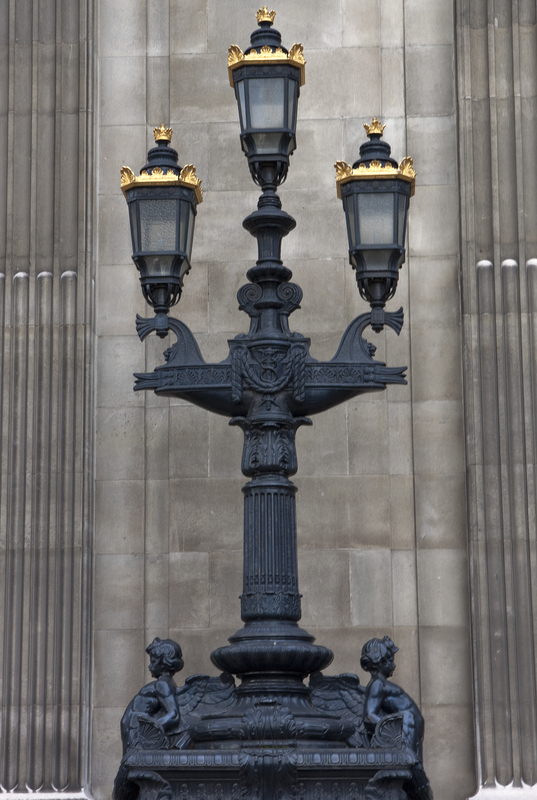 A lamp outside the Port of London Authority building implies a triangle. 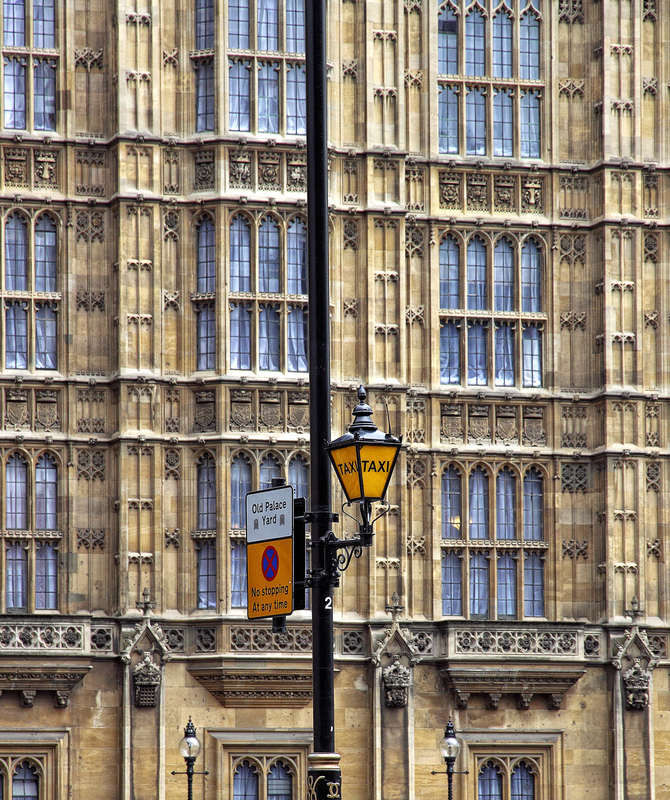 Each lamp forms a triangle within itself and then, together, combine to produce another triangle. I could have focussed in on just the lamps and their horizontal base but the whole ensemble also creates yet another triangle. 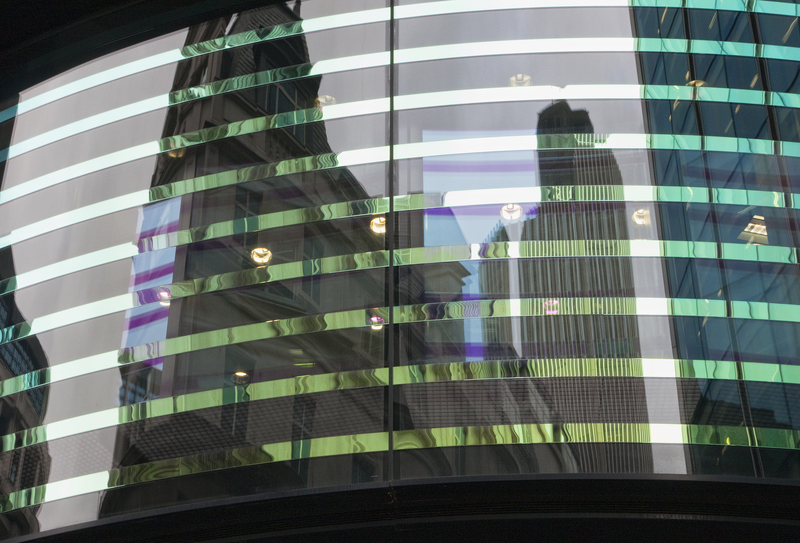 There is both rhythm and pattern in the reflection of the buildings against the colours in the window bands. 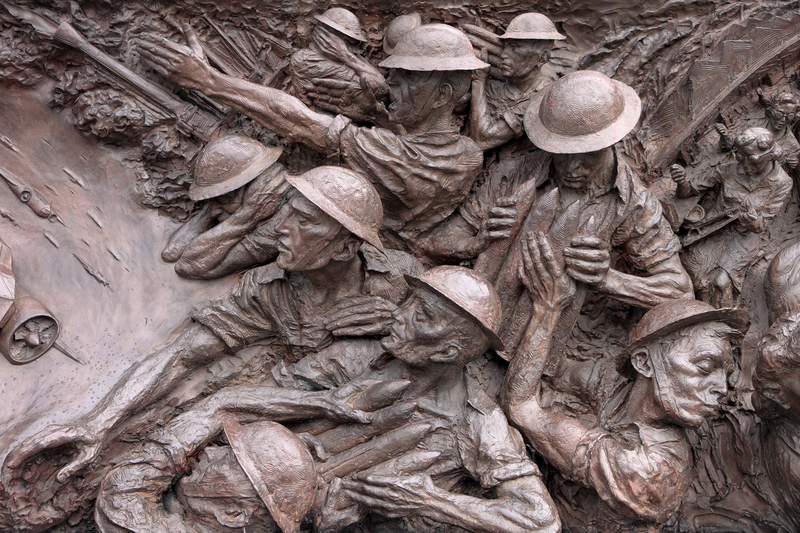 Detail from Battle of Britain memorial. The helmets and arms create rhythm here for me and give a sense of dynamism and movement. There is also an implied triangle formed by the men’s bodies and a pattern created by the helmets. I spent a lot of time on the exercises and Assignment and, as I mentioned earlier, ended up feeling quite swamped with all the images. To some extent I think that there was a mirroring effect going on as I was sorting order out of chaos and recognizing graphic elements in images. In some respects I think I’ve ended up playing somewhat safe and keeping things simple but, as a result, I’ve now become more consciously aware of lines and shapes which means that my skills in composition should have improved.